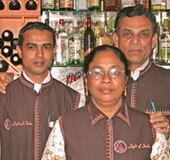 Conveniently located in the heart of the Glebe, a vibrant Ottawa downtown neighborhood, Light of India Restaurant offers a unique Indian gastronomic experience. The warmly lit restaurant features a daily luncheon and Sunday brunch buffet, and an à la carte dinner menu of traditional dishes from the northeastern region of India . With lots of fine choices, the flavourful menu also includes a number of combination platters and dishes perfect for sharing and sampling.